Fiona told the BBC Scotland news website: “As an adult I found it difficult to get used to life with extra medical things. “I have Ehlers Danlos syndrome and spent a third of the year in hospital in 2017. “For most of that year I had a nasal tube and had to get used to it. “I do crafts and soon after I was asked by a friend to create a teddy for a little girl with autism. 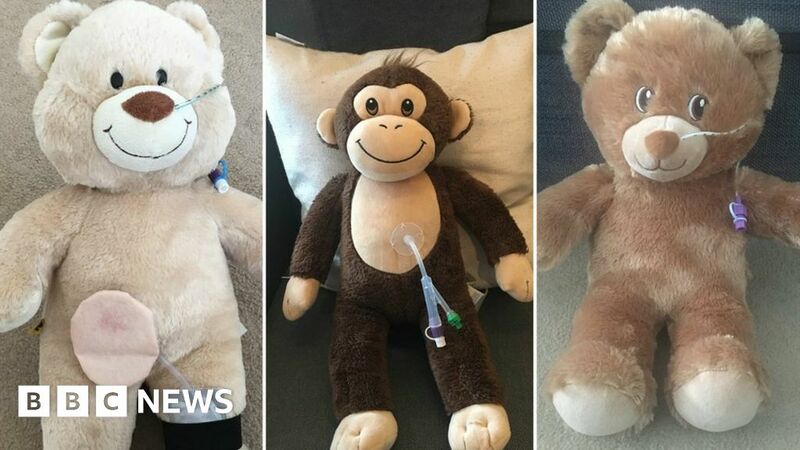 Fiona believes the teddies – made with real fittings and tubes – help children adjust and also teach those around them about the child’s condition. She said: “Sick children often have a non-sick sibling. It helps them get used to it. They can play with them, touch them and even learn what parents do to manage and clean them. Fiona’s work helped one mum – Emily Cotton. Emily said: “The teddy has helped my daughter adapt to the medical devices she now has. International Tube Feeding Awareness week runs from 4-8 February and Fiona feels she is paying it forward – passing on a kind deed – by doing what she does.